1. I should probably start by apologizing for this bacon shortage thing. 2. Bands with vaguely spiritual lyrics and at least one instance of profanity are now a niche market. 3. When my two sons started playing together and were kind to one another the other night, I instantly opened to the book of Revelation to see if it was a sign. 4. My wife thinks I have a mancrush on R.A. Dickey. I mean, just because I want to get in touch with him so we can talk British Lit and the Knuckleball over tea….in the soft moonlight? 5. You know, if you don’t watch TV, you won’t have to see NBC’s commercials for their shows. 6. What am I gonna do after this last week of fantasy baseball…besides reintroduce myself to my wife and kids? 8. A sure sign that my 3 year old son is gonna need counseling when he is older is his love for Yo-Gabba-Gabba. 9. For Halloween, I was thinking about going as something fairly easy to pull off, you know, like a frustrated banker. 10. So the real refs will finally be back tonight and everything will change and no one will complain about the officiating in the NFL anymore. 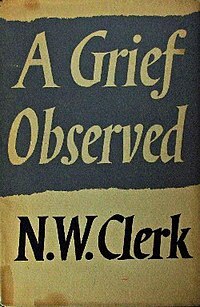 On Sunday I read A Grief Observed by C.S. Lewis again. I’ve read it once each year since I bough it in December of ’08 in Wichita, KS. I don’t know why I keep going back to it. The first time I read it, I was shocked. I’d read a good bit of Lewis before, but this unmitigated emotion and frustration on display made me wriggle in my bed as I read it that first night. I can remember feeling the cool outside, even though our heat worked fine. That’s how cool it gets in Wichita in December. Lewis’ books are like that, you remember the world around as read him, as he most likely remembered the world around him as he wrote. And I needed some wisdom. We had moved our family up there just 6 months earlier and the pastor had already left. We felt unsettled. And I found myself wanting to read outside of the neo-Reformed world I was in. And I needed to read someone who wrote well. About a week earlier I had gone into Eighth Day Books and plundered the C.S. Lewis shelf. Surprised by Joy was the highlight. I savored that one. I read that one every year too. But that one I read every year intentionally, whereas A Grief Observed has been accidental. Last night I sat outside in the dark with Billie Holiday and my pipe and asked myself why I keep coming back to this little book. It’s a painful read. His grief is full-tilt and in your face in a way none of his others work are or could be. I guess it’s because of the honesty. C.S. Lewis is one of the most beloved Christian public figures there is. Liberals and conservatives alike, love him. And here is he is for all the world to see, struggling with the loss of his wife, in full view of everyone. I keep using the word “full.” And that’s what this book is. For it to be so small, there is a fullness within. The full range of emotions. The full chest of one who breathes deep a rare air of honesty with himself and the rest of us. So full of wisdom. This little book is a strange help. I’ve not lost my wife to cancer. Nor my parents. Or anyone close, yet. But grief and hurt and the feelings of helplessness and loneliness are not foreign to any of us. And he never feeds us a gospel-hyphenated sugar pill. Only red meat. Could a pastor have written these things? I doubt it. The expectations are too great. I’m sure he had to deal with those too. But he could ask the questions and stagger alone in the darkness, drunk of grief, without the baggage of a reverend. And none of his answers are all that preachy. There is no sentimental spirituality. Even a former pastor like myself would have not been able to resist a sermon before it was all over. Isn’t it strange that Lewis is so popular and yet not a pastor. More pastoral than just about anyone, really. Sure, he preached a few times. But he was not a Reverend. He was just a Literature Professor, who believed. We need more of these. More voices, not trained in the phrases of the pulpit. more voices, full to the brim with the warmth of words. Am I the only one who settles into Lewis the way others settle into soft blankets on a cold windy night full of stars? This is no denigration of pastors. I am more than thankful for their work. But I want more writers who are writers and readers and lovers and dreamers and seers of all the little details of life that can get lost in the big visions. Pastors are professionally spiritual. Their doubts must be reined in. They can talk about their struggles with sin, especially if they are of the masculine sort. But the ones in the pew can doubt out loud. Well, at least C.S. Lewis can. Maybe the attraction of Lewis’s Grief is that it’s familiar. I’ve never been there but it has all the telltale signs of my own weakness and wondering. None of us would be able to express it like Lewis but the hell he traversed in the wake of Joy’s death is a path we will make our way upon one day soon. We’ll probably be angry and question and keep grasping at the rope expecting its end to show up any moment. I’m just glad to know someone so sane as Lewis has gone on ahead of me and lived to tell of it. 1. My wife said I needed to write something light on my blog or people would think I was depressed. Course I couldn’t hear her, I was listening to Adele sing ‘Someone Like You’ over and over. 2. My kids keep expecting me to buy them stuff like food and clothing. 3. Sometimes while talking to customers about their finances I wonder how they would respond if I told them I failed Algebra 2. Aaaaand the second time I only “passed” because my teacher was tired of me. 4. How come there are no TV shows with tough female leads that look like super models? 5. You know what’s funny? Turkey Bacon. 6. I’ll take Romney’s “gaffe” over Obama’s hanging out with celebs while our embassies burn. 7. When is Jane Austen gonna stop being so lazy and write us another novel? 8. Why do my neighbors with pristine yards keep offering me their lawn and garden tools “to use anytime I need them”? 9. After a year in the banking industry I am pretty sure most people think banks should just give them money because they want it. 10. My kids are awesome. You want one of ’em? One year ago today I put on a blue suit. My parents bought me that blue suit back in 2003. I picked out the suit from a department store at the St. Louis Galleria on the occasion of my graduation from Covenant Seminary with a Masters of Divinity. More than 8 years later I put it on to walk away from the world of vocational ministry and to enter the world of business. I knew so very little of this world it felt as if the blue suit was the only thing covering my naked nerves. I thought I was pretty world-wise. And I was to a point. But I was a babe in the woods. Naive to what this new world was all about. That first day in orientation is still a vivid memory. Focus was difficult. Everything was surreal. There was a “This is really happening” thread through all my emotions and thoughts. When the orientation was over, my most natural reaction was to notice how awkward it was no one closed in prayer. That’s how strange it was to me. The room was a little warm for my taste but I kept the coat of the blue suit on anyway. The only other person wearing a suit was the speaker at the front of the room, for someone reason this reassured me. That may have been arrogance or wishful thinking. He went through all the values of the company, the vision and the mission, etc. And here is where my naivete shone forth like a Fourth of July fireworks display. I soaked it in and was encouraged, believing it like a little kid watching commercials. This is not to suggest there are not more than few who really believe in these values, I just assumed they would be something of a daily guide. For the life of me I cannot remember what I ate for lunch that day. It’s possible I went home since it was really only a half day. Usually, I can remember food in all it’s glorious detail. But that day, meals escape me. My wife asked me how it went and I am certain I said it went well and was impressed with what I was told. But heck, I wanted to be impressed. I wanted to like my new company and where I was casting my line for sustenance. The need to be positive and optimistic was overwhelming because I’d been looking for a job for a while. Almost six months, I think. No company would even talk to me. I received no responses. Nothing. I even had help from people and I could get no traction. I never knew what the obstacle was. My resumés as seeds could find no purchase. Regardless, it killed all the hope I had put in my abilities and drove me to prayer in a very new way. Along with anxiety about doing something wholly new, there was a sense of victory. It wasn’t pride or anything like that. Just victory…I don’t know how else to describe the way I felt. I’d finally found a position, thanks to a friend I ran into at a Gilian Welch and Dave Rawlings concert. Finally, a job. Victory! A year later it feels like defeat. I would love to say that when I still put on the blue suit, the nerves have steadied and the victory has only been confirmed. But that would not be the truth. The truth is it feels like plain old fashioned defeat. I’ve been reading a lot of baseball books lately. For some reason, I cannot get enough of them. One in particular reminded me of a game I played in when just a young teenager. I was probably 13 or 14 years old and I was pitching. It might have been an All Star game because I think it was in the summer. Can’t remember all of the details but some remain in High Definition. I was horrible to the point of feeling completely out of control. I remember crying and wishing I would get pulled out. And I remember Jan Jones was there watching it all unfold. Other defeats have been worse. But this one sums it up this best. Lack of control of the situation, wishing someone would rescue me, and not doing well in full view of those whose opinion matters. While I appreciate your sympathy, that is not why I tell the truth about this. I tell the truth because I have learned things I could have never learned otherwise. The most important thing I’ve learned is the reality of the situation I find myself in. Even if I had never experienced it, the defeat is felt by people every where. Those without jobs and those in jobs they hate and feel trapped in. They have to work because they need to take care of their family but they wade into defeat everyday. And it creeps up to their chin, week in and week out, threatening to drown them in soul-sucking monotony and dignity-stealing dead-ends. I can’t imagine. Those who have, have a character and an emotional fortitude far beyond my own. They are the faceless heroes, providing for their loved ones at the expense of their pride and all the dreams they dream under star-pocked nights. Before this past year I would have listened to their troubles and had one of two reactions… depending on my mood that day. There is a good chance I would have dealt with their pain by getting to them see how much they are whining. I would shame them into acknowledging they should stop and just realize so many have it worse. Or I might have just told them they are not believing the gospel at this time in their life and they need a fresh vision of what Christ has done. They just need to preach the gospel to themselves. But now that I find myself numbered among them, all that sounds hollow and inconsiderate. It doesn’t sound like the patience and kindness of the Holy Spirit. It sounds like the Pharisees who thought people with problems were placed before them to only be fixed. So maybe it’s not only defeat. Maybe there is something mixed in making it a little more than just that. I wouldn’t call it victory but something altogether different. It’s the hope in God that can come served only with a hearty helping of defeat. It’s a hope with eternity and all it’s promises spread out like a clear cobalt-blue sky before me. Bluer even than the suit I’m wearing. I know this all sounds sad, but, I mean, all those promises sound a little tinny without at least a little defeat now and then. Are you holding your breath, for too many years to count? All these thoughts and hurts and fears and cares and joys and feelings causing our chest to heave in the quiet moments are not our’s alone. There is at least one other person who sees and feels these things. God has made another, not only in his image but in whom we can see even a shadow of a reflection of our own soul. Last monday I heard this over and over. I heard from some who had been hurt by the church…or more specifically a particular church. I heard from some who were just going through difficult circumtances and could not find the energy to be excited about much of anything. Belief was still present and alive but all it’s strength was being spent in just hanging on. And I heard from those exhausted by the roller-coaster rides. Their stomachs churned one too many times because of the highs and lows of a Christian experience replete with emotion and lacking in sobriety. The twists and turns and changing tracks were just too much. Hopefully the lack once despised is now not missed. After all, we have not been called to excitement about church but to love Him, the Head of the Church and his people. All else may just be filigree, luxuries some of us cannot emotionally afford right now. What now, though? How do we move on? As I talked with people about this and looked back over my own life over the past couple of years, the corporate worship was a focal point. Makes sense. This is where the excitement is expected and is expected to be worked out in public. I’ve felt the pressure to be moved emotionally and even dispostionally in corporate worship that caused me to struggle to want to be there. I’ve had two conversations with people who I know well, both are decidedly not excited about church, particularly the worship service. One is struggling with just keeping their children still so they can glean something from the sermon. Another is frustrated with the sermons, period. Neither seems to be getting much. They want to receive a word of encouragement, something to move them along in this life under grace. But it ain’t happening. I told them both the same thing. I didn’t have advice. So I unfolded to them where I am and have been for almost a year. My own struggle started more than a year ago. I’d never struggled like this before. I didn’t understand it at all. I wasn’t depressed. I wasn’t losing my faith. But that excitement and enthusiasm for church was waning continuously. Even as we moved from the church where I served, to sitting in the “pew” of the church where my wife and I met and grew so much years ago, I found it hard to emotionally be glad I was there. I wanted to be in church on one level. I knew it was needed. But man, it was painful. However, there was one thing that kept me going and keeps me going still. It keeps me moving forward even when my faith is not an excited one. I sought just one thing. I went each time asking God to give me just one thing only. Whether it was a line in a song, a verse or even a word in a verse, or communion itself, I was after just one thing. Even if everything else fell flat, even if the sermon was off, the music offended, or something ridiculous was said, that one thing was enough. This was a struggle with myself, I knew full well. So instead of looking for something dramatic, I hunted between all the parts for just a nugget of help. Communion always guaranteed this. Each time I tasted the elements, my whole self engaged with my need, his provision. Those few minutes seemed to reach back over time and extend into the coming week. Often, I would only be encouraged by the knowledge that I am communing with all the Saints in the room and who have tasted this meal since it was given to us. And sometimes it was a little more mysterious and I would’t be able to explain it other than to say, Jesus knew what he was doing in giving us this gift. Just sitting in a pew is hard when you’ve been to Seminary. Criticism is second nature. The difficulty is being critical about, well, pretty much everything. So now I fight to not really care like I did. I just need something. I used to want a service that would catapult me into the week with wild-eyed abandon for God and his glory. Now I look for a phrase giving me the will to take just another cautious step, maybe two. Now I feast on details. Small parts. I don’t expect to walk away “wowed” by a worship experience. And God is gracious. In between the crevices of all the building blocks of a worship service are notes and words and moments of silence (even moments of laughter) quietly calling me to trust him. To trust him when every fiber of my being is stretched out into the great unknowns of life is the goal now anyway. So I told them I was just looking for one thing to help me every time I was in corporate worship. Of course, this assumes that even in the worst of churches, there is something to be had of God and his goodness to sinners. This is no call to stay in bad churches. This is no call to leave them. I’m only saying – for those who are struggling in corporate worship, there is probably one nugget of grace like gold you can hoard. You may even be able to mine that one nugget and come across the mother-lode of all finds – a truth you would never have found otherwise. And then not trade for all the excitement you once had.